Stunning views of the Damaraland landscape. Visit the Organ Pipes and Brandberg Mountain. See the ancient Bushman rock paintings. Enjoy the unique style of this remote lodge. Seek out the desert-adapted elephant. 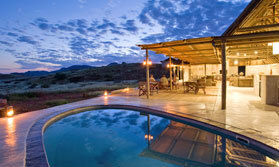 Mowani Mountain Camp occupies an enviable position, perched amid rocky boulders in Namibia's stunning Damaraland. Like its sister camp, Kipwe, Mowani has been cleverly constructed to blend into the surroundings, and manages this seemlessly with the help of an innovative design. The decor at Mowani is subtle, tasteful and uses local artworks and furniture to finish off the look, all in warm browns, beiges and natural tones. There are 13 rooms and 2 suites. They are all thatched with dome roofs resembling the surrounding boulders, and the walls are curved. The rooms are split into 'superior' and 'superior view' rooms, the names being self explanatory. The views are spectacular though so they do deserve a mention, there is nothing more relaxing, yet revitalising than sitting on your veranda drinking in the scenery. All rooms have en-sutie facilities with a shower and bath, hairdryer and bathrobes are supplied. The rooms have twin beds (which can be converted to King size), a fan, tea and coffee and a safe. The mini thatched suite has a lounge with air-conditioning, a satellite television, a double room with en-suite bathroom, a laundry service and minibar (drinks included). It also has an outside shower set amongst the boulders and a private veranda. The Mountain Suite is the ultimate in service with it's own butler. It comes complete with air-conditioning, a satellite television and CD music centre, private dining and bar facilities, a double room with en-suite bathroom which includes a bush bath and shower with a view. At Mowani you can choose to explore the area in your own vehicle or, at extra cost you can join the excursions organised by the lodge. Visits to Twyfelfontein will enable you to see ancient rock engravings and also the geological oners of the Organ Pipes and Brandberg Mountain. Alternatively enjoy morning elephant and dune drives which take between 4-6 hours and you may come across desert-adapted elephant. Nature walks in the area around the lodge allow you to explore the smaller details of the bush, it's amazing what you might miss from a vehicle. But if you prefer, you can always relax on your private deck, dip in the rocky pool and drink-in the beautful surroundings. Open: Mowani Mountain Lodge is open all year round. Rooms: There are 13 rooms and 2 suites. The rooms are split between 'superior' and 'superior view' the only difference being the view. They all have have en-sutie facilities with a shower and bath, hairdryer and bathrobes are supplied. The rooms have twin beds (which can be converted to King size), a fan, tea and coffee and a safe, each also has a private veranda. The two suite have a separate lounge area, inside and outside bathrooms, satellite TV, airconditioning, minibar and the Mountain suite also has a private dining area with butler service. Activities: It is possible to explore with your own vehicle, but the lodge also offers drives to see the ancient rock paintings at Twyfelfontein and the Organ Pipes. You can also partake in a 4-6 hour drive in the area seeking out desert-adapted elephant and other game, and there are guided nature walks around the lodge. All these are at extra cost. Facilities: Mowani's main areas of the bar, lounge and dining area are housed under two large dome-thatched rondavels. The vibe here is relaxed and the decor comfortable and stylish. Just below the main area is a small pool with loungers on a deck area built between the boulders, the view from the pool is also excellent. Dining: Meals are served at individual tables, indoors or outdoors as you prefer. The tables are beautifully laid. Private dining is available in the suites only. Health: This is a malaria area. Communication: Internet is available in reception only. Notes: The lodge accepts visa and mastercard and cash in Namibian dollars or South African Rand Euros, US Dollars and UK Pounds. See the best scenery and wildlife Namibia has to offer while staying in luxury accommodation and enjoying supern service - this is Naimbia in luxury.